This group consists of KREVA (MC and producer), MCU (MC), Little (MC), and DJ Shuho as well as frequent appearances by DJ Tastuta. Their first major release, “Vitalizer” (2002, won them massive recognition into the mainstream of Japan. The album’s success was due to the consistent sound that fed off the newer more techno oriented beats that frequent the Japanese Hip-Hop sound. 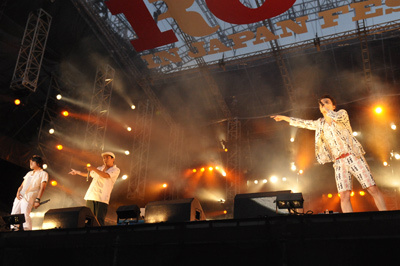 After “Vitalizer” they got down on one of their most celebrated tracks, “Sayonara Sayonara”. This single helped to fuel the next album “Magic Number” (2003). Going stronger than ever they released a “Best Album” compiling their pop hits from 2001-2003. 2004 saw their last release as a group to date “Good Music”, which took a step back from their mainstream sound and helped to showcase their technical abilities to rhyme as a unit. Obviously the Beastie Boys will come to mind when thinking of the similarities of the 3 MCs and one DJ form as well as MCU’s subtle shout to MCA by taking a similar aconym configuration. Now the 3 have gone onto solo productions, KREVA being the most successful as a producer and rapper.